The PAC-MAN Pizza Parlor is open for business! When Cathy's father loses his memory, it's up to her to run the family pizza parlor. Fortunately, PAC-MAN is on the job to lend a helping hand. 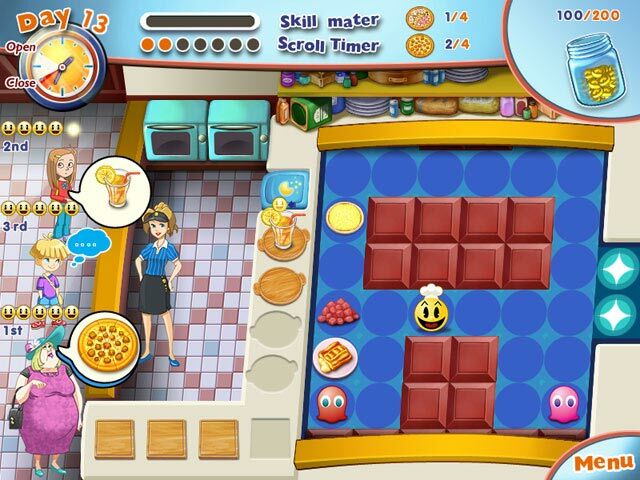 Help PAC-MAN and Cathy serve hungry customers through tons of tasty treats and delicious dishes in PAC-MAN Pizza Parlor, a fun Time Management game. 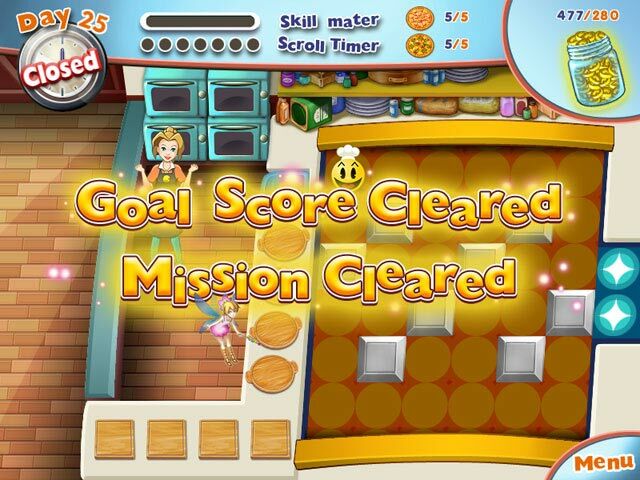 With dozens of cool unlockables and equipment, you can customize your kitchen to your tastes! 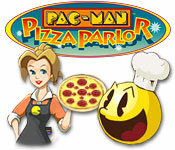 PAC-MAN Pizza Parlor is rated 4.2 out of 5 by 5. Rated 5 out of 5 by pizzavanity from AWESOME Game! Great storyline, fun gameplay. I loved playing pacman as a kid and I love time management games and cooking games so this was super fun to play. 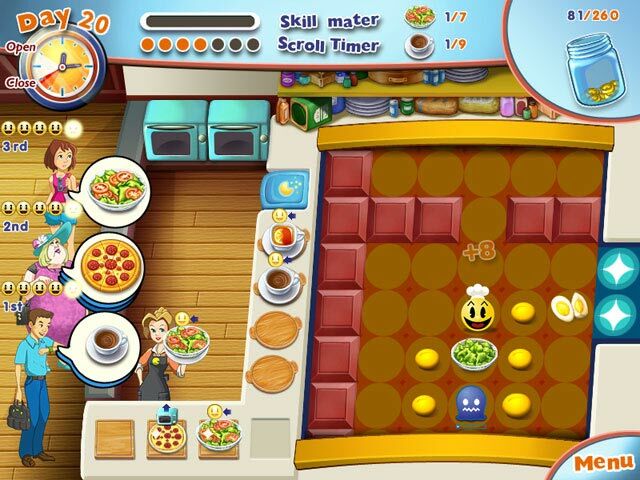 A great twist on cooking time management games since it has a pacman theme and some mini games as well. Lots of fun, and not too difficult but challenging enough. I loved it. Rated 5 out of 5 by YoshisArmy from 20 Stars! Two enthusiastic thumbs up! I love this game! It's a great and unique concept, and you get to try lots of new receipes. The Pac-Man character was a fun addition. Recommended by a serious gamer! Rated 3 out of 5 by Ruckus777 from Nice Graphics, But Otherwise Not Great I got excited about finding a Pac-Man TM game, since I love TM games and remember playing Pac-Man as a kid. The opening sequence of this game with the manga-style comic was really appealing in art style, and though the story was a bit ridiculous, it was still a charming intro to the game. However, when the actual game started I lost interest almost immediately. Firstly, the sound effects are much too loud compared to the rest of the game at a normal volume. Though the in-game graphics remained appealing to look at, I already felt a bit disoriented from the get go. The game mechanics felt like somewhat of an homage to the original Pac-Man games, with Pac-Man moving across the screen to pick up items for customers, but overall they were much too clunky and difficult to maneuver. I also felt like the difficulty level went up way too fast to keep up with, and it just felt way too overwhelming. Overall, this game wasn't my cup of tea, and I could barely get through the demo. Rated 3 out of 5 by Yaelle from Thought I Was Going to Love -Aggravatingly Hard After Awhile There is a point within this game where it becomes absolutely unrealistically difficult. I thought I was an expert but it just gets to be annoying & I had quit playing altogether. Mostly I was just really psyched to see a Pac Man-themed game at all and since I like Time Management, I went ahead & bought. BUT if you don't enjoy games grating on your last nerve, I don't recommend this.